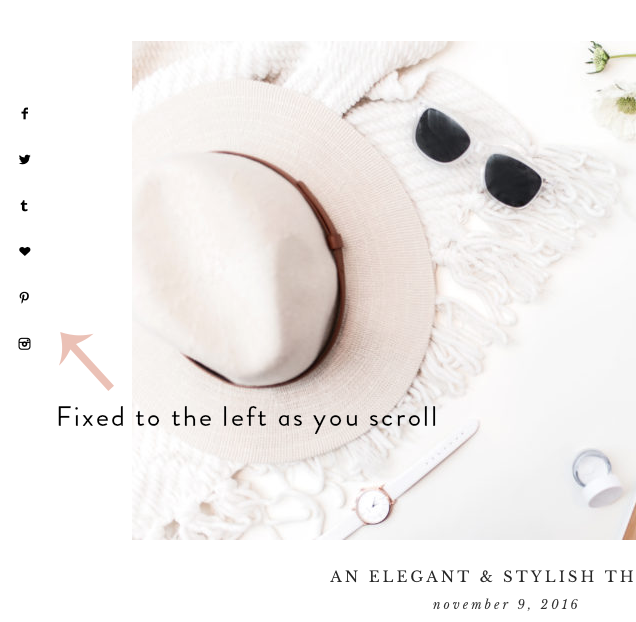 If you'd like to prominently feature your social icons, adding a floating sidebar is a great way to put them front and center on your site. Below we'll show you how to implement floating social icons in any 17th Avenue Wordpress theme. 1. Go to Wordpress > Appearance > Customize > Additional CSS. 2. Paste this code snippet in the box. If using the Amelia theme, scroll down for ALTERNATE code. 3. After pasting the code, click Update File. 4. Open the Social Icons code file that came with your theme (or grab the code from the bottom of this page). Add your links per the theme instructions. 5. Go to Wordpress > Appearance > Widgets. 6. Drag a Custom HTML widget into the Primary Sidebar widget area. Paste your code in the text box and then save. 7. If your icons aren't displaying like the screenshot above, you may need to clear your cache. Note: If you are using a website-style theme that has no sidebar on the home page, place the Custom HTML widget in a footer widget area instead (i.e. Footer 1).